In this article, I am going to introduce how to import an asset made with Unity, to STYLY. You can use Unity assets such as 3D models, Particle systems (Shuriken), Lights, UI elements, Shaders (such as ones using Amplified Shader), and assets that use PlayMaker. STYLY is compatible with assets with animations or interactive functions, and assets with colored lights. I hope you create original assets and use them in STYLY! 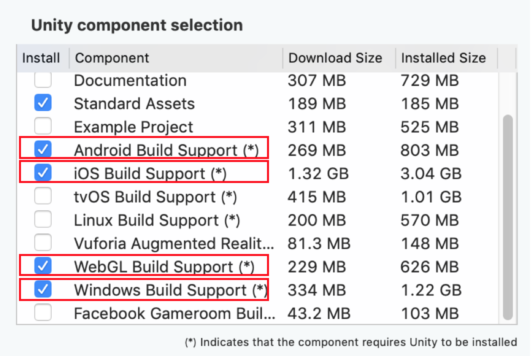 Unity version 2017.4.x is supported. Also, the following components are needed. You can upload the following assets to STYLY by using Unity Asset Uploader. The upload process is the same for any asset. You just need to save the asset as a prefab, and follow the steps in this tutorial. CAUTION: If animations set with PlayMaker does not work in STYLY, delete the cache files of your browser. Also, please be aware that STYLY does not support scripts written in C#. 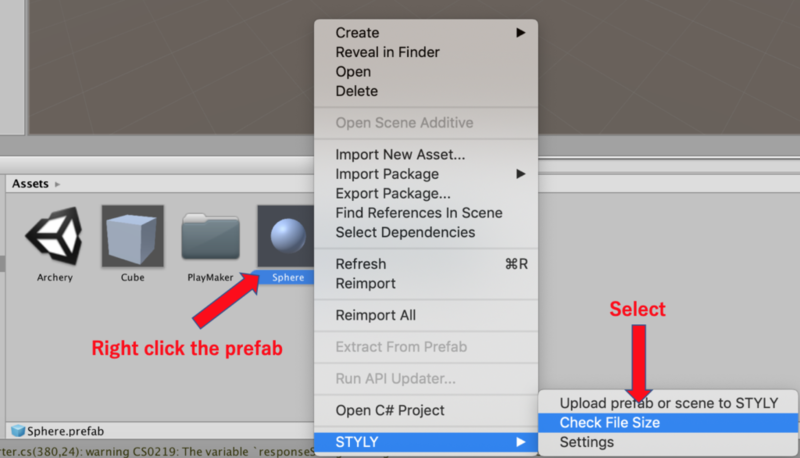 You can upload prefabs you create in Unity to STYLY by using UNITY PLUGIN FOR STYLY. I will explain the steps to download UNITY PLUGIN FOR STYLY. First, please access the link below, or go to the STYLY top menu, and click the [DOWNLOAD] menu. 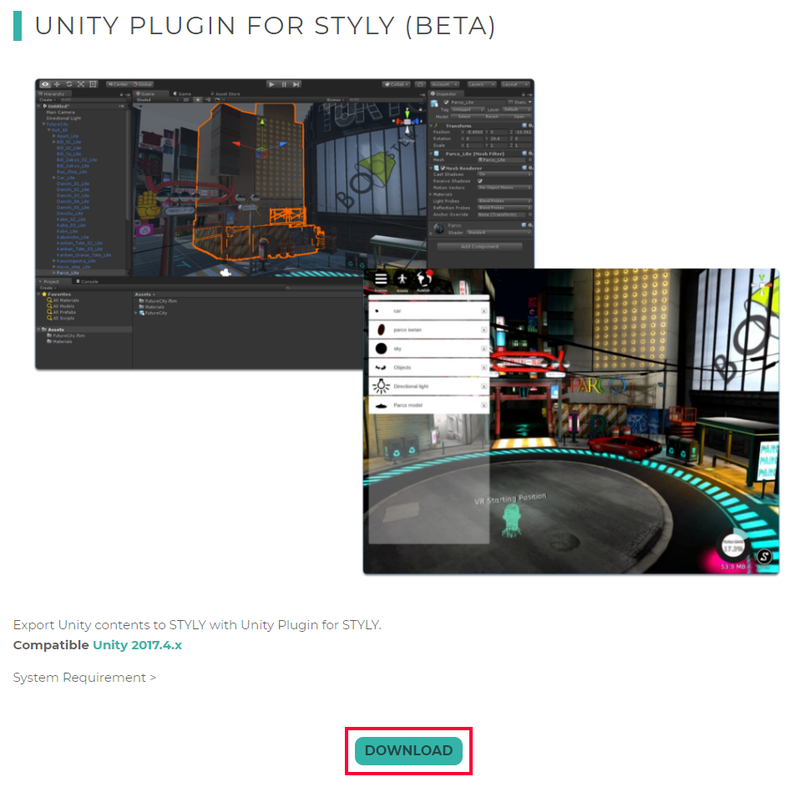 In the DOWNLOAD page, click the [DOWNLOAD] button for UNITY PLUGIN FOR STYLY (BETA). 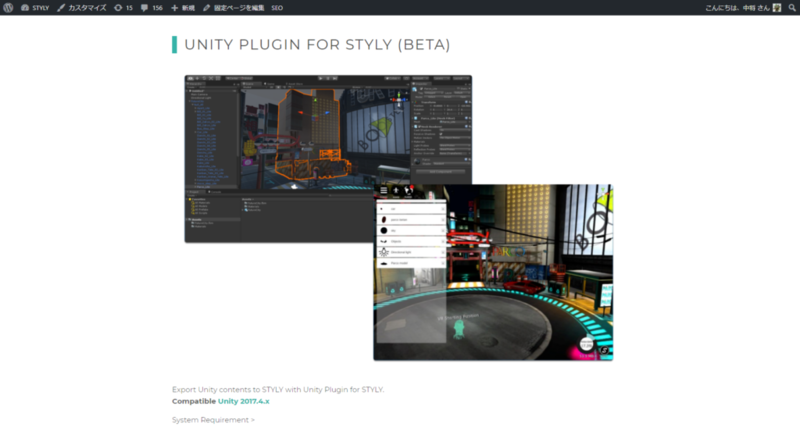 Once the download is completed, import the UNITY PLUGIN FOR STYLY (BETA) to your Unity project. Open your Unity project. Go to [Assets] > [Import Package], and click [Custom Package…]. 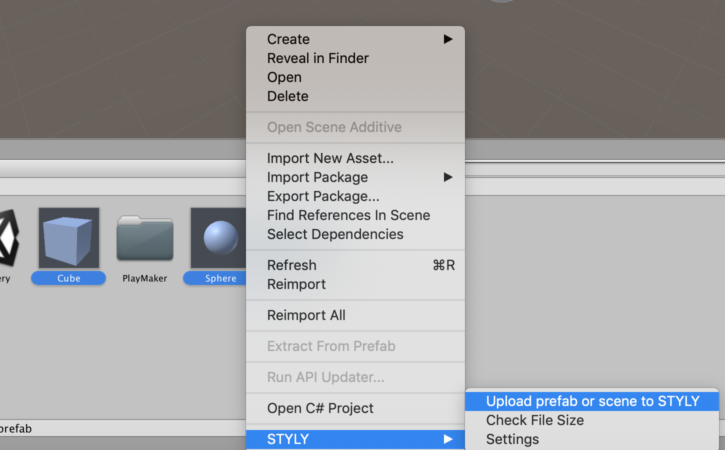 Select the “STYLY.unitypackage” you just downloaded, and click the [Open] button. Check all the checkboxes and click the [Import] button. After the import is complete, [STYLY] will be added to your menu, and a [STYLY_Plugin] folder will be added in your Project window. First, you need to get your API key for your STYLY account. I will explain how you get your API key next. Login to STYLY WebEditor, and select the [API Key] menu. Your API key will show up, so copy it. Go to the [STYLY] menu in your Unity project, and click [Asset Uploader Settings]. Type your email address of your account in the Email form. For the API Key, paste the API key info you copied in the last step. Your STYLY account and the STYLY_Plugin are linked now. I will introduce how to check the file size of a prefab. If the file size is huge, the upload will take minutes or much more, so checking the file size of your prefab is important. To check the file size, you need to right-click the prefab file, and choose [STYLY] > [Check File Size]. The recommended size is less than 20MB. Once you made sure the file size is ok, the next step is to upload the prefab you created to STYLY. Let’s begin the upload! First, right-click the prefab you want to upload. Then, click [STYLY] > [Build And Upload Prefab Asset], and the upload process will begin. When the upload is complete, a popup message “Upload succeeded.” will show up, so press the [OK] button. If an upload error occurs, please send the error message and details (such as what you were doing, and screenshots) to the contacts below. STYLY is now able to upload multiple prefabs. 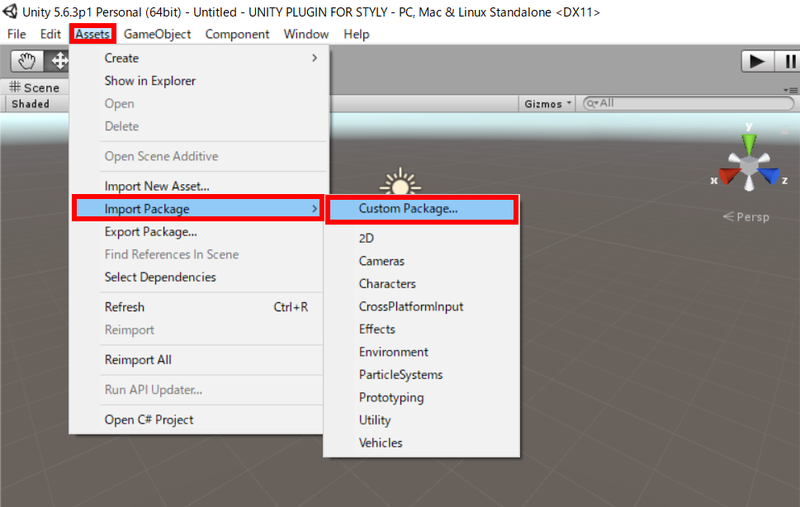 Download the latest version of the STYLY.unitypackage, and import it to your Unity project the same way as the previous one. 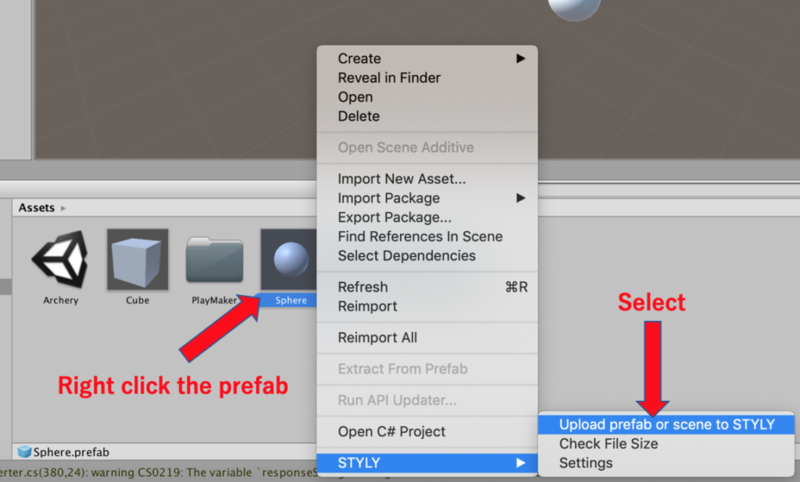 Select the prefabs you want to upload, and right click them. Select [STYLY] > [Upload scene to STYLY] just as you did previously. You can upload multiple prefabs at once with this process now! I will explain how to access the prefab you uploaded. Open the STYLY WebEditor. 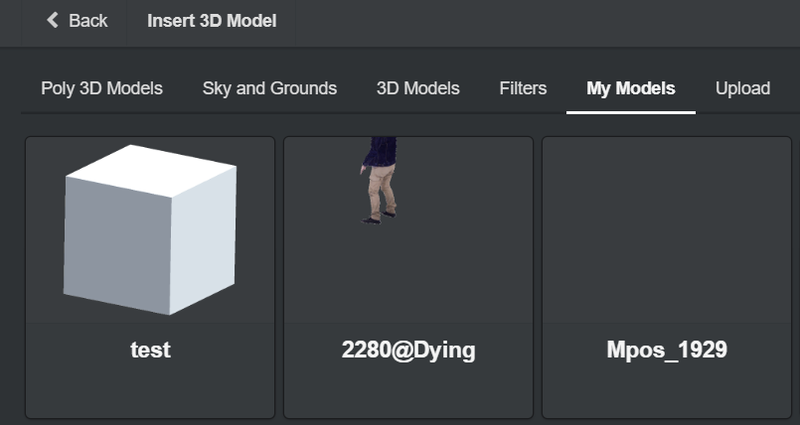 Click the [Assets] button, and click [3D Model]. Finally, click the [My Models] menu. Your asset will be displayed in there.